Birmingham is playing in a decent level and having an okay form as Blackpool isn't winning away games for like a decade. As they are going to look for a mid table position, Blackpool's relegation is a no brain here. 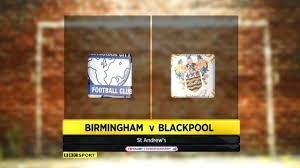 I don't believe blackpool have any confidence to make something happen, specially outside and as Birmingham made it to hold a win after 6 games, I believe they are going to keep their pace against Blackpool and hold a great win here. As I see , Birmingham was not playing that bad and I believe their gain of confidence coming from their last game will make they get what it takes to get our odds here.